Prof KB is basically a Mechanical Engineer. Then, qualified himself as diploma in Chemical, Process, Instrumentation and Control. Then Prof.KB moved on to management discipline . He did his post graduate diploma in Finance Management, then did MBA (Marketing ) & then M.Phil (Management).Presently he is doing Ph.D in Dissemination of ElectriCity Car charged by Renewable Energy,that is fuel free ,IC Engine free eco friendly car all over world in another 10 years. He is the CEO of Creative Management Consultancy (CMC). Presently, he is acting as a Management and Project Consultant for over 75 Companies. He is a Visiting Management Professor for over 35 Management Institutions. Prof.KB has produced over 13,000 M.B.A students in the last 20 years. He has written 27 Management Book. Out of that Enterprise wide information system (EIS) has emerged as only prescribed text book of Bharathidasan University for BCA & B Sc (IT). He is a regular trainer for BHEL (Bharat Heavy Electricals Limited),HRDC - Trichy. In the past trained over 7000 employees ranging from GM to Worker level. He has written 10 Tamil books. Tamil readers affectionately call him as “Chinthanai Cirpi”.His blogspot www.chinthanaicirpi.blogspot.in is one of the top 50 Tamil Blog spot having readers from over 50 countries viewed over 20,000 pages. Motivated over 3500 Teachers/ Faculties & 32,000 students of various Nursery & Primary, Middle, High School and Higher Secondary Schools, Colleges & University. His 'You Tube' motivational speech videos viewed by over 35,000 people all over world. As a Secretary of Genius Educational Trust,running Bharathiyar University Study Centre for Trichi & Periyar University Study Centre for Trichi & Pudukotai and acted a catalyst for producing 2500 + UG,PG & Research Scholars in the last 8 years. 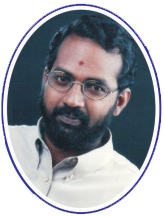 He is the regional coordinator of Bharathiyar University, Trichi Region. Running a Genius nursery and primary school ,at Pudukkottai,which is a model school of entire Pudukotai District based 185 schools. He is the Founder of Global Green Growth Group (4G). 4G is the only Non Governmental organisation in the whole world exclusively focusing in mitigating Global warming,by way of reversing CO 2 clock to Sustainable November,1988 level. That is reducing CO 2 level from unpalatable level of 400 PPM exist as on date to sustainable level of 350 PPM through large scale Tulsi ( Holy Basil) Cultivation. Tulsi is the only plant in the whole world which offer 20 hours Oxygen and 4 Hours Ozone,which will solve two prime issues of world,that is CO 2 reduction as well as Ozone layer depletion. He is also the founder of “Minsaara Kuppai Kanna”, a voluntary organization to E-waste (Electronic waste) free Chennai and Tamil Nadu. He is a Director in Half a dozen companies related to his vision of creating Carbon less World. Having Two dozen tie up with World Class companies focussing in Energy Saving range of products, Green Power Generation through Solar and wind of MW level as well as KW level. Prof.KB is true workaholic working round the clock carrying out yeoman service to humanity with a vision to see Carbon Less World and Sustainable Development well within his life time.